Popping, cracking sounds, sore jaw points, facial pain, headaches and stiffness. These are just some of the common symptoms of jaw pain. Your jaw joint is called the temporomandibular joint (TMJ). When this area that runs just in front of your ears is strained, you may experience a host of painful symptoms. For some people, braces can help reduce strain on your jaw joints and ease the symptoms of Temporal mandibular joint disorder (TMD). Bad bite and improper alignment can result in TMD or jaw pain. Using braces to ease the pain and correct the issue may alleviate the underlying issues, too. The temporomandibular joint is found on either side of your jaw. It attaches your jaw to the bottom of the skull. The muscles near the joint help open and close your mouth. If your joint can’t move properly or is out of line, you are likely to suffer TMJ disorder. Many adults between the ages of 20 and 40 suffer from TMJ problems. Temporal mandibular joint disorder (TMD) is a fairly common issue. It may be as minor as little clicking sounds when you open or close your mouth. It can also be as serious as constant pain and discomfort. Many people who experience TMD may leave it undiagnosed for years and then, once they are diagnosed, might not do anything to treat the condition. But there are a few simple treatments that do alleviate the disorder. Braces are one of them. Some of the most common symptoms of TMD include earache, pain on either one or both jaw points, stiff jaw muscles and pain when you chew. You may even notice a change in how your teeth fit together. What’s the Cause of TMD? Very little is really known about what exactly causes jaw pain. However, there are a few behaviours known to contribute to it. For instance, grinding your teeth can put a lot of pressure on the joint, making an inflamed joint worse. Also, clenching your teeth will make matters worse. Sometimes, the cushion in your socket joint could become misaligned. This is usually what causes the clicking sound you hear when you open and close your mouth. Another common contributor to TMD is stress. Not only does stress make you clench your jaw or grind your teeth, but it also makes you tighten your muscles in your jaw and face. This puts even more pressure on the joints, resulting in jaw pain. Arthritis is another known contributor to TMD. The two are highly common and non-invasive TMD treatments. The first is a night guard. The night guard holds your teeth apart, so you can’t grind them while you sleep. When you ease the pressure on the TMJ, the joint can slide back into place, lessening jaw pain. Another option for TMD is braces. Since the jaw pain is often caused by problems with your bite, when you correct your bite, you relieve the pain and pressure on the joint. The alignment of your teeth, not just next to each other but also across your jaws, can help your condition if you experience discomfort or pain in the joint of your jaw. Often, when people get braces, they consider how their teeth will look and how they are arranged across the jaw. However, most orthodontic treatment is designed to adjust the way your teeth are aligned across both the jaws. Jaw clenching and teeth grinding are two common issues that are solved with the help of braces. That’s because braces are designed to help your teeth into a straighter position. Even if your teeth are fairly straight, you may still want braces to help fix TMJ-related bite issues. The treatments that are used to retain the effects of orthodontic treatment may also help keep jaw pain at bay. Could Braces Help Your Jaw Pain? 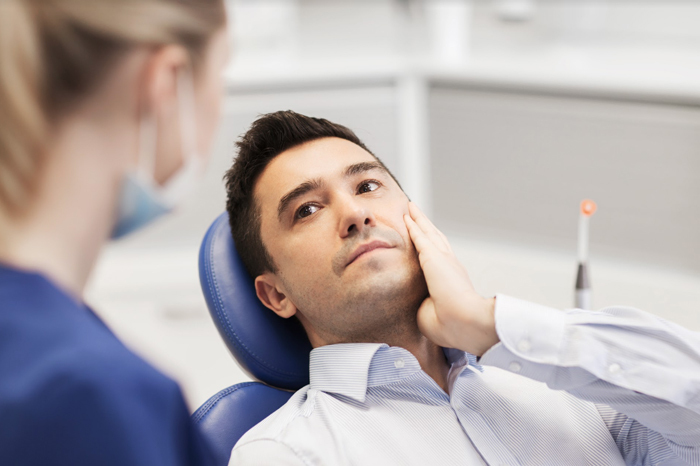 When it comes to TMD, treatments can vary depending on your pain. But, if the pain is related to clenching and grinding your teeth, or a problem with your bite, braces might help. Once your teeth are correctly aligned, your temporomandibular joint can shift back into alignment. A properly aligned bite can help to reduce, or perhaps even eliminate, recurring jaw pain. What’s more, when your bite is aligned, you are less likely to grind your teeth and clench your jaw when you are asleep. These may seem like minor changes, but they can significantly improve the quality of your life. Braces are mainly designed to correct teeth spacing issues and align your bite, but many patients enjoy the benefit of less jaw pain. In other instances, a combination of treatments, such as braces muscle stimulation or stress reduction to reduce tension in your jaw may be necessary to alleviate TMD. Being aware of what causes tension can help, too. Do you clench when stressed? Do you find yourself chewing a pencil? By being aware of your behaviours, you can break a bad habit and ease your jaw pain. Sometimes, modifying your diet could help. Try to cut food into smaller pieces, eat softer foods and stay away from chewy and sticky foods like gum. Also, ask your orthodontist about gentle exercises to strengthen and stretch the muscles of your jaw. A warm compress placed on your jaw can also help to alleviate tension and pain. Correcting a misaligned bite and teeth can significantly help reduce the symptoms of TMD, which range from face pain to muscle spasms, and even pain shooting down your shoulders. Often, temporomandibular joint pain is accompanied by dizziness and headaches, too. If you do need braces to alleviate jaw pain and TMD, you have a number of options. From traditional metal braces to nearly invisible aligners, there is an orthodontic treatment to suit your budget, lifestyle and condition. If you experience jaw pain, it’s time to book an appointment. Contact Medland Orthodontics today to schedule your consultation and find out how braces can help alleviate TMD.